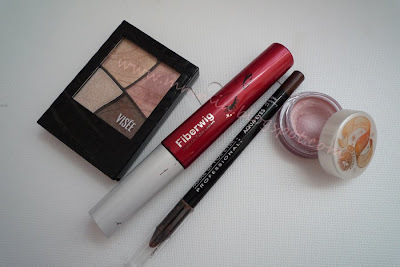 I have yet another Visee palette and EOTD to show everyone today. This palette was from Kay when she did the secret Santa, and what a Santa she was! 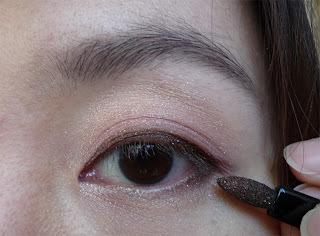 Seeing how much time I have now that school has finished (for now), I decided to do another step by step tutorial using the Visee Glam Hunt Eyes in Mauve. 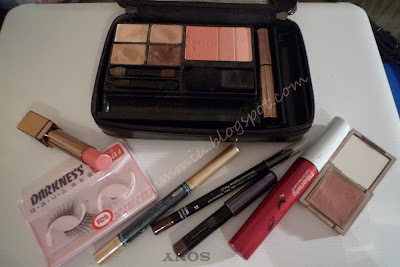 Again, I was quite surprised for the amount of pigmentation from the Visee palettes. I think this one showed up better than most of the palettes that I used for my EOTDs. I have to admit I was kinda intimidated by this palette at first because of how dark the colors were (from the usual ones that I use), but I ended up liking the results. I just sat in front of my window to take the pictures and if there's too much glare, I just pull the curtain over to change the amount of light that I want. I prefer taking pictures late in the afternoon, that way there's a good amount of light without washing out the colors. If anyone is interested, I'm using my Panasonic Lumix FX38 that Tim got for my birthday last year. Very beautiful shades, makes a nice day time or smokey look. Using the MM cream shadow again. Highlight with shade #1. I used the steps that were printed on the box of the Visee palette. 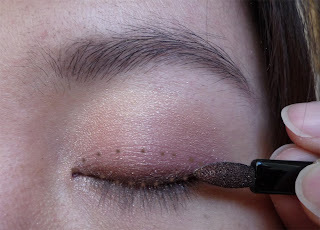 Applied shade #2 all over lid and used a bit of shade #1 to blend it together at the crease. 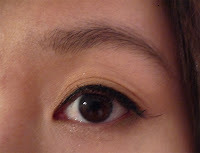 I must say, the Etude House brush does a very good job at picking up lots of shadow. Using shade #3, adding more color to the outer and brough it up just a little. Haha, you don't understand how many times I had to take this picture to get the liners at the right position. Line 1/3 of the way in on the lower lashline. 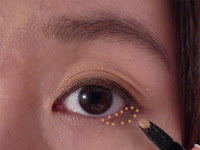 As for the top, it doesn't really matter how thick or thin since it'll be smudged anyway, it depends how dramatic you want the finished look. Smudge shade #4 on top of the black liner. Smudged shade #2 on the lower. 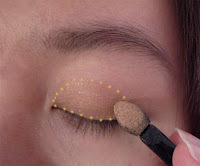 Highlight the inner corners using shade #5. The finished look! It's not as shimmery as I thought, but still has some sparkle to it. 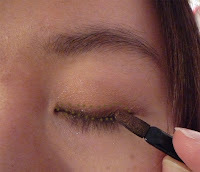 For extra oomph, add false lashes. Thank you for all the comments on my last post =) I'm doing my best to start catching up on blog reading. Better than me sitting in front of the TV all day. Do you remember my video on my weird Japanese curling comb? Click here if you forgot. Well, Tim and I like looking for deals and he found a website that sells some really cheap stuff and some nifty beauty products, including the amazing comb I got from my friend. I know KT did a review on it as well, but I can't seem to find the post. He's ordered from the site before and he already helped me order some things yesterday so there shouldn't be a problem with the sellers. And best of all, the shipping is free. I believe the products come directly from the manufacturer that's why they're so cheap. Anyway, if you've always wanted to try that curling comb (Bobodave sells it for $43USD) or the fringe styler that I showed in this video, here's your chance to get it for a great price from Deal Extreme. I believe the prices at in USD. This is super long over due, I've had the Visee Brilliance Forming Eyes A-1 since August 2009 and I haven't used it other than swatching. Finally decided to try something different for a change, no neutrals today! I didn't bother taking a FOTD, I spent the entire day being lazy and didn't have to get ready to go out until late in the afternoon, I looked too tired in the pictures. Using a cream shadow base really helps bring out the colors (Majolica Majorca PK705). If I didn't use it, the final look would be washed out. 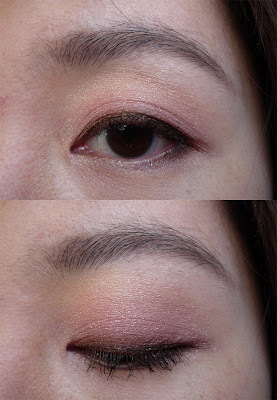 Even though the MM cream shadow is sheer, it still helps a lot. 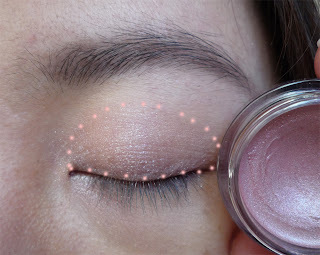 I do this step everytime I use eyeshadows if I have the right cream shadow colors to use. The sponge applicators that came with this palette isn't the best, so I just used a brush. 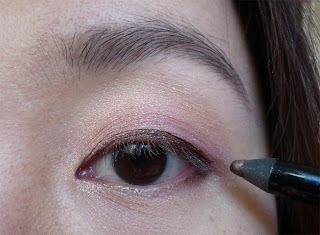 I'm amazed at how pigmented these shadows were for a drugstore brand. This is my first Visee palette and I got it while in Tokyo. 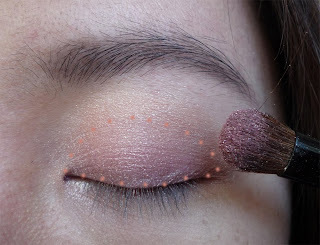 Blending the pink shade up to the gold. I didn't use the glittery cream shade, didn't really like it. 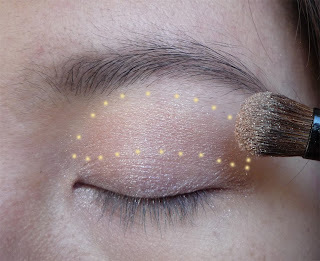 Line the top and lower 1/3 of the way in with MUFE. 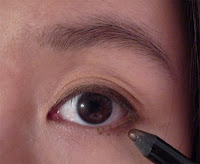 Blending the brown shade almost halfway up to make the liner look softer. Do the same for the bottom to make a softer look. 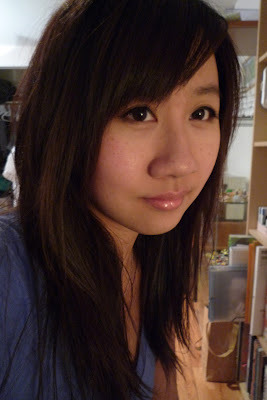 And the final outcome, with my tired looking eyes. Geez, a little change in the weather and my allergies go crazy. It's a high of 6C in Toronto which isn't normal for February. It should be covered with snow and freezing outside. I've ordered some clothes from Yesstyle at the beginning of the month and they should be coming this week, I'm sooo impatient! Also, my order of China Glaze still isn't here bah! Uhhh..so apparently there's someone out there who reads my blog/cbox and went on to another blog to write crap using my url.. seriously, why? That's why I don't like cbox because anyone can use your url/email. Having a cbox is nice to read/reply to quick comments, but not this. As for the blog who got shitted on with my url, sorry, the world's not perfect, I'm not going to add every single blog out there. If I can relate to a certain blog or if I feel that it will be a good link for myself (or any readers out there), then I will add you, and that's mainly the reason why I do so. 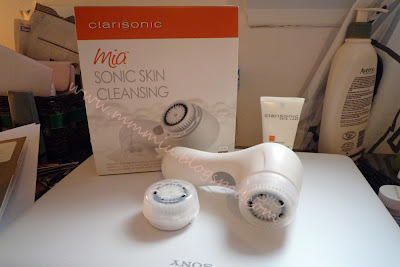 I got a prepaid Amex as a gift which went towards my purchase of the Clarisonic Mia. I had to put down some extra to get it and let me tell you, it ain't cheap. It's really too bad that Sephora Canada doesn't sell it in stores or online, so I probably paid a wee bit too much for it from Holt Renfrew (the equivalent of Saks I believe). Hopefully it'll live up to what it says it does. 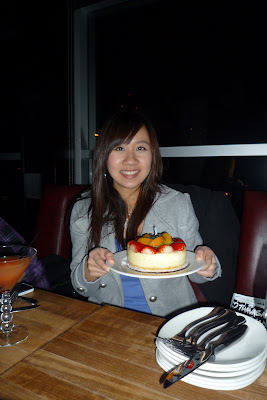 It's so nice to have a birthday around Chinese New Year (Feb 11), I get an extra bit of money which is always good. With that said, I already planned out what my next big purchase is later this week, if I can find it. I decided to go bold for my birthday look, and by bold I mean putting some eyeliner on the bottom and using false eyelashes! I used brown to line the bottom and I liked this look quite a lot, you know the "your eyes but better" if there is such a thing. I forgot to mark the shadows I used, but it's the lower 2 on the Lunasol Beige Beige palette. The blush is Lunasol EX01 Soft Silver Rose and lipstick is 02 Coral Pink. 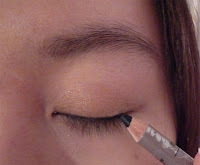 Powder touch eyebrow pencil is Maquillage GY950. The picture tutorial pretty much speaks for itself, so I'm not going to explain. I think I'm starting to like using false eyelashes I went and bought another Darkness in Kma1. I used the Duo waterproof glue in this look and by the time I got home after 4 hours or so, the middle part of the lashes weren't sticking anymore except the ends, maybe I need more glue. Only 3 more days of school and my exam, then I can finally rest for 2 weeks yay! Speaking of school, there's this woman that's terribly annoying and stupid. There's so many questions that is just common sense but she is out in space somewhere. Once she was trying to argue with the prof on why she shouldn't make a lesson plan even though it was one of the required assignments. A couple weeks ago, she asked me, "Is rice a vegetable?" Really? And you're trying to be an English teacher? ?